Kayak is a comprehensive system for managing subscriptions and distribution. It is a tool for managing customer service, invoicing, accounts receivable, marketing and sales related to printed and digital products and services. The mailing and distribution, including interfaces, of printed products also ensures a well-functioning logistics chain. In terms of digital products, solutions related to managing read permissions, including interfaces, provide the opportunity to take advantage of Kayak’s centralized customer database in targeting and ordering various content. The Kayak interface was designed together with user interface design (UX) specialists for the needs of customer service. The customer service module’s views and workflows were designed and tested to ensure that all necessary information is easily available and that making changes to subscriptions is as easy and quick as possible. Thanks to its modular structure, Kayak can be tailored to meet your company’s needs. Interfaces and integrations with your company’s other IT systems are easy via the open and flexible interface architecture. Real-time integration between systems is easy with Kayak’s SOAP/Web Service interface. Publishers can outsource to Jaicom all of their customer service, invoicing operations, payment transactions and the sending of material to be mailed to printing houses. Jaicom also implements customer self-service sites that can be separately customized for each title. Publishers are able to focus on their core business and monitor the development of their subscription base through Jaicom’s BI and reporting system. 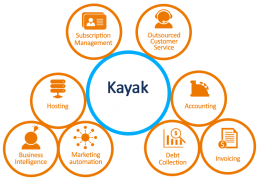 The Kayak Plus service package seamlessly complements the Kayak system and includes additional services for your company’s customer management needs. Some of the services are produced in cooperation with selected partners. Fast and easy to use tool to create web campaigns. All the basic information of the campaigns are brought from Kayak and then completed with pictures and marketing texts. The tool has an admin interface for creating and publishing the campaigns and planning the end user view. The management of subscriber gifts is also included. As a part of customer communication and marketing, CampaignMail can send out one-way marketing messages or two-way campaign messages to the customer, which customer can answer by selecting the desired subscription option. The Kayak Cloud Service in its simplest form is the Kayak system on the internet, but it can be scaled as needed into a complete service, including all functions related to customer service – right up to payment transaction monitoring. Our Private Cloud Service is suitable for all sizes of publishers, and for use by associations as a means of managing member data and selling merchandise. Kayak Cloud Service is tailored to meet your company’s needs. All Kayak Plus extensions can be easily added to the service.